Horseback riding in the Copper Mountain Colorado area is an experience of a lifetime. If you never rode before the Copper Mountain area wranglers will teach you and make sure you have a fun experience. There are nice and easy trail rides, in and around Copper Mountain area, that will go through fields of wildflowers, crossing streams and simply enjoying the scenery. For the more experienced rider, there is open range riding in the Copper Mountain area where you can get your horse galloping. Want to be a real cowboys or cowgirls, go on a cattle drive, in Copper Mountain area. This adventure is great for groups & reunions and a wonderful corporate teambuilding event. This unique experience of being part of a Colorado cattle drive will be a memorable experience for all. 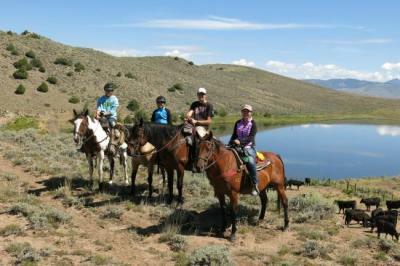 Horseback riding in Copper Mountain Colorado area is a fun family or corporate adventure. Bringing your family on vacation with little ones to Colorado, let the kids take a pony ride, the Rocky Mountains await them. Another fun vacation activity for the family a group or corporate outing is Copper Mountain area saddle / paddle. Go whitewater rafting and then continue on horseback, or go horseback riding first then experience rafting on one of Colorado's rivers. That's having a fun filled day in Colorado, saddle up! Saddle up for a guided tour through the White River National forest in Keystone, and experience spectacular views of the Continental Divide, Gore and Ten Mile Ranges. There’s something about the outside of a horse that’s good for the inside of a person! Experience the Old West with Triple G Outfitters and Guides, the oldest family operated stables in the valley. MAKE YOUR LIFE AN ADVENTURE TODAY! Come join us for an epic Colorado river rafting adventure! A four season wilderness guide and outfitter. This is truly open ranch riding with the most breathtaking views ever.